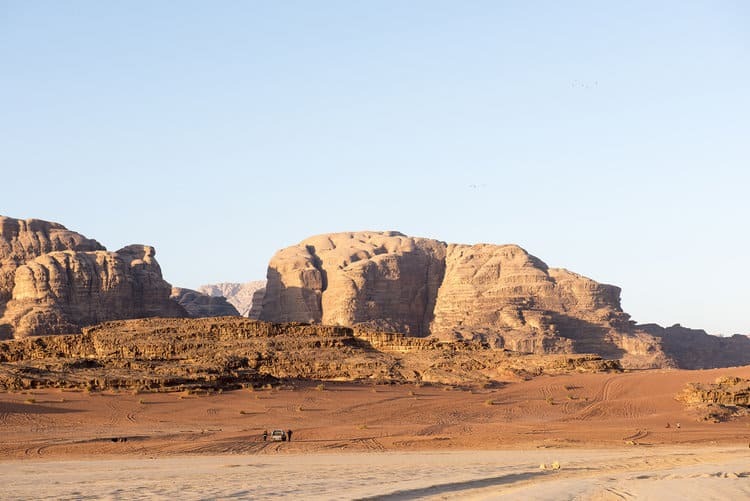 The Wadi Rum desert is a pro­tec­ted wil­der­ness in the south of Jordan. It’s dra­mat­ic land­scape spans over 720 sq km and fea­tures deep red val­leys of sand­stone jebels, nat­ur­al arches and pre-his­tor­ic carvings that date back to 7700 BC. It is no sur­prise that this incred­ible scenery has been the back­drop to a num­ber of films includ­ing; The Mar­tian and Rogue One: A Star Wars Story and The Last Days on Mars. 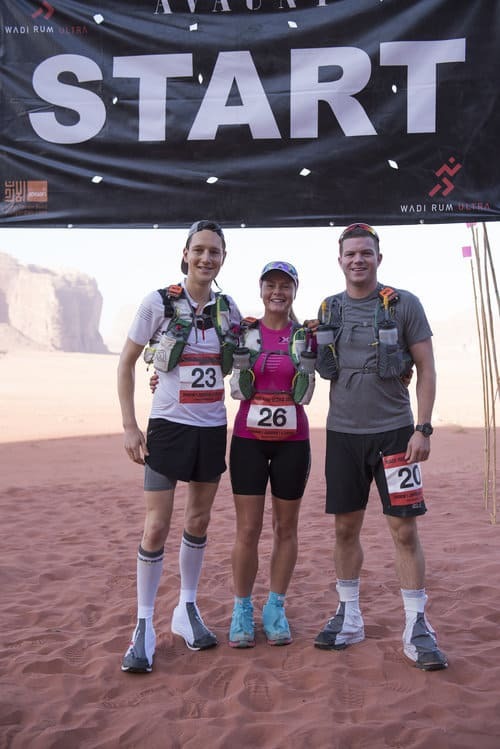 The Wadi Rum Ultra is the only race in this part of the world and that is one of many things that makes this race so spe­cial. The race cov­ers 260km, over 5 days. 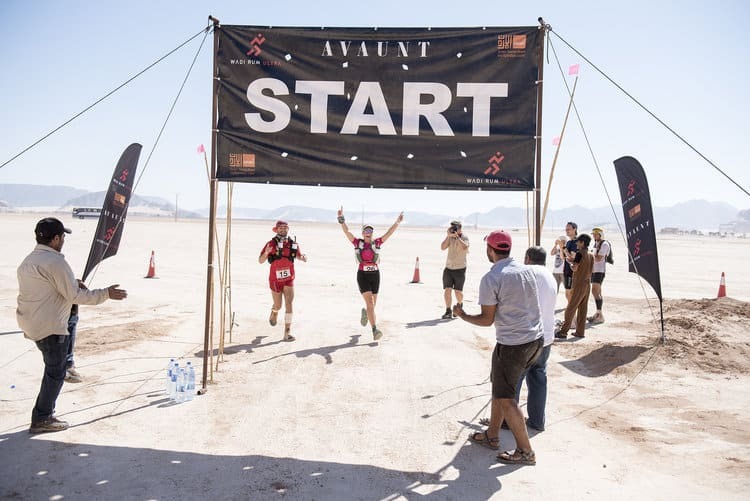 Run­ners are required to bring all their nutri­tion to the race but trans­port is provided for overnight bags from camp to camp so you only need to run with your daily pro­vi­sions. This is the second year the race has been run­ning so the field was small with just 20 par­ti­cipants, the major­ity of which were from the UK. It was nice to exper­i­ence a more intim­ate race where you have the oppor­tun­ity to build rela­tion­ships with all the run­ners and organ­isers. I feel lucky to have done it this year and think that over the next few years it has the poten­tial to sub­stan­tially grow. 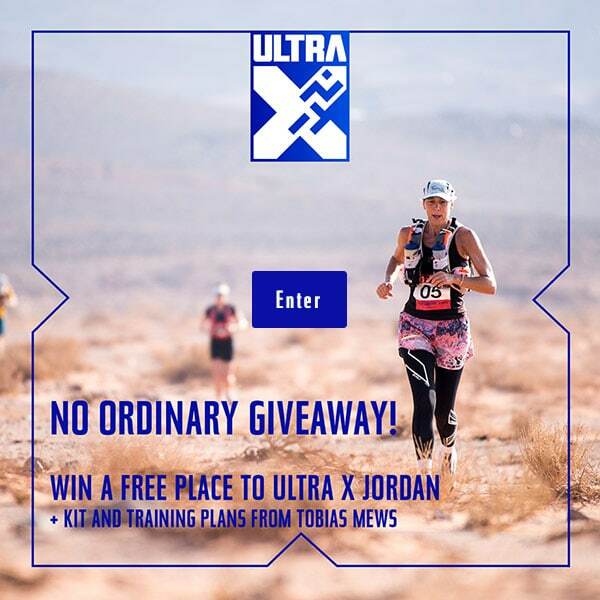 An example of test­ing ALL your kit before race day was my water bottles, which star­ted leak­ing after about 20 seconds from the start line day 1! So I had a wet right knee for the whole 5 days. I had just 8 weeks to train but knew I was work­ing off a sol­id base of fit­ness hav­ing just com­pleted my first Iron­man in July. My weekly mileage only peaked at 100km but I also swam twice a week, had one strength and con­di­tion­ing ses­sion and some­times also a spin on my turbo. I’ve also found much more bene­fit in qual­ity over quant­ity in terms of mileage as I’ve gained more exper­i­ence in endur­ance sports. All my runs have some sort of focus; wheth­er it be a tempo ses­sion or long run to test out my nutri­tion strategy. Pre­par­ing for a race like this requires much more than just phys­ic­al train­ing. There are many oth­er ele­ments to con­sider such as the sand, the heat, your hydra­tion, nutri­tion and kit. Pre­par­ing for these factors requires hours of research, ana­lys­is and doc­u­ment­ing in mega spread­sheets. As with any race, I try to rep­lic­ate the con­di­tions of the race in my train­ing. This meant bikram yoga classes in the two weeks lead­ing up to the race to accli­mat­ise to hot­ter tem­per­at­ures, long trail runs on the week­ends and test­ing kit and nutri­tion in train­ing ses­sions. Day 1 of the race star­ted on Monday so every­one flew out on Sat­urday to arrive at the crack of dawn on Sunday for the kit check and race brief­ing day. On enter­ing the desert, we were driv­en on the back of trucks to our first camp where we stayed for the first three nights. Sleep­ing arrange­ments were tents of 3 — 8 people, each with mat­tresses, which felt like lux­ury and made the world of dif­fer­ence to get­ting a decent nights sleep. Between the tents was a fire and lounge area which became the com­mun­al spot for eat­ing, stretch­ing and chat­ting to the rest of the group after each days run­ning. My goals for the race were to run close to the whole race, enjoy myself, push hard, keep con­sist­ent through­out the week and use Day 1 to judge where I should aim to fin­ish in the field. A short stumpy kind of gaiter spe­cific­ally designed for the desert. The way these work are that a vel­cro strip which comes with them, is stitched dir­ectly onto the train­er just above the sole, by a cob­bler (wouldn’t recom­mend doing this your­self!). I found a great cob­bler near Green Park tube who turned it around in 24 hours. It was called ‘Sole Man’, 1 White Horse Street, and they did a fant­ast­ic job. The gaiter then affixes onto this vel­cro strap, and is excep­tion­ally effect­ive — no sand came in at all, and had no issues with these what­so­ever. Highly recom­men­ded. On the morn­ing of Day 1, I was feel­ing excited and nervous. My race strategy is always to run to how I feel and I wanted this to be at a com­fort­able pace that I could main­tain through­out the day. Day 1 can be a game changer in a multi stage race. If you go out too hard, you will pay the price for the rest of the week. I knew I shouldn’t get car­ried away with the ini­tial rush and ended up fin­ish­ing Day 1 in 3rd pos­i­tion after start­ing out in 7th. My tac­tic soon became known to most of the oth­er run­ners that I enjoyed hunt­ing people down, all the way to the fin­ish, so I got giv­en the nick­name ‘The Black Wid­ow’ or ‘The Ter­min­at­or.’ This of course, did not apply to Salameh Al Aqra or Sam Hay­ward who led the race from the front of the pack all week. Salameh Al Aqra, a loc­al Jord­anese pro­fes­sion­al run­ner is a truly humble and inspir­a­tion­al guy and Sam Heward, equally as humble and inspir­a­tion­al has the poten­tial to wow us all in his run­ning future. I was pleased to feel strong from Day 1 and fin­ish­ing in 3rd over­all gave me con­fid­ence in my abil­ity and the drive to per­form well for the rest of the week. Feel­ing strong meant I could enjoy myself for the most part and push hard when times got tough. And boy did they… The heat was relent­less, par­tic­u­larly on Day 4 that was spent pre­dom­in­antly on salt flats. In times like this, I’d dig deep and focus on not let­ting it get the bet­ter of me, tak­ing one check­point at a time and think­ing of how good cross­ing the fin­ish line feels. 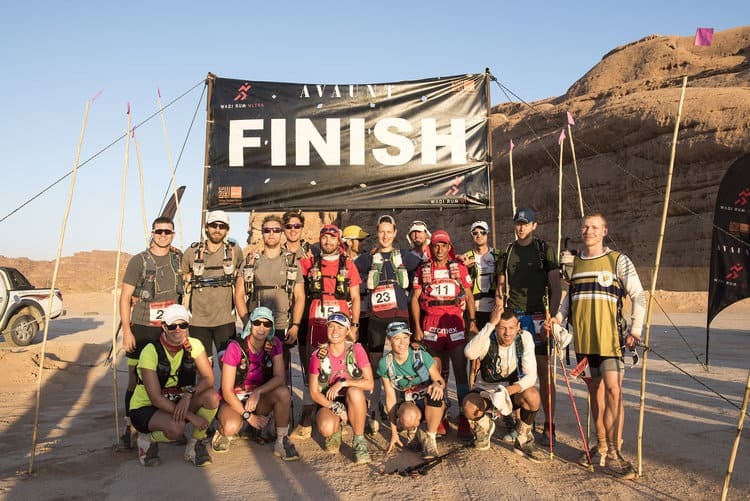 Most of the course was run­nable and even where it wasn’t, I’d shuffle through the sand or up the hills, keep­ing a decent pace so I could get to the fin­ish line each day as early as pos­sible, usu­ally by lunch time. 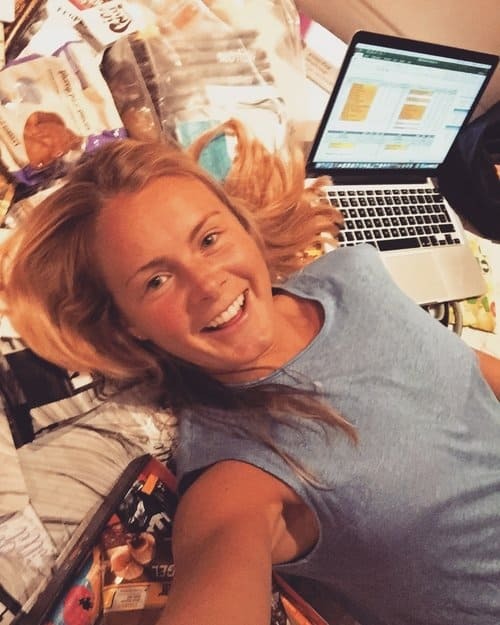 This meant I’d have the after­noon to rest and recov­er in the form of re-fuel­ling, put­ting the legs up and get­ting mas­sages from Kier­an (Jus­tOne­Body), our race osteo­path and Lucy, the physio­ther­ap­ist, both of whom did a for­mid­able job in tak­ing care of all of us. I man­aged to main­tain my pos­i­tion of 3rd over­all and 1st lady till the end of the race, which sur­passed my per­form­ance expect­a­tions and I couldn’t be hap­pi­er with. I was pleased with the major­ity of my nutri­tion for the week. I ate just short of 3000 cal­or­ies per day; 500 for break­fast, 500 for sup­per, 800 — 1000 dur­ing run­ning and anoth­er 800 — 1000 for a recov­ery shake and snacks while recov­er­ing in camp. My nutri­tion strategy whilst run­ning was struc­tured around tak­ing on fuel every 45 minutes. This var­ied between solids, gels and powdered sachets to reduce the chances of my stom­ach being over­whelmed by just one type of fuel. Each provided me with roughly 30g of carbs, which might be too little or too much for oth­ers but worked well for me as I nev­er felt low on energy or slug­gish in com­par­is­on. I tried LYO dehyd­rated meals for the first time and won’t be look­ing back for any future desert races. All their ingredi­ents are nat­ur­al and you get much bet­ter mac­ros in com­par­is­on to oth­er brands. The beef strogan­off and coconut por­ridge were a per­son­al favour­ite! I also tried Tent Meals for extra vari­ety and both their break­fasts and main meals were deli­cious. 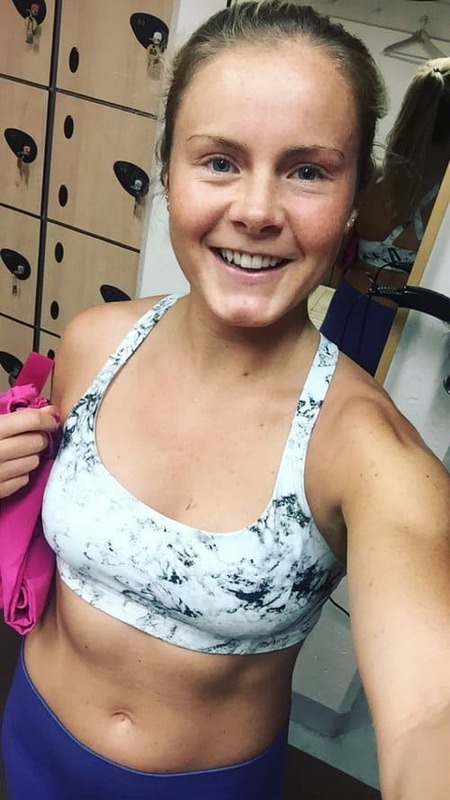 The only thing I would have changed for my nutri­tion would be repla­cing some of my after­noon snacks with anoth­er 500 cal­or­ie meal as I often had a long time to wait till din­ner by the time I had fin­ished run­ning. Hydra­tion wise, I drank close to 1.5l every 10km — 750ml of which had Elete in and the oth­er 750ml was plain water. Hydra­tion strategy is so per­son depend­ant but I know how much I sweat so ensured I drank fre­quently in small quant­it­ies. Desert AR gaiters — didn’t get one sand gran­ule in my shoes! Injinji socks — pre­ven­ted all but one blister between my toes! Ulti­mate Dir­ec­tion Scott Jurek Trail pack — amaz­ing bag with per­fect stor­age and hydra­tion facil­it­ies. Fit per­fectly, looked good and once again can­not fault! Sun­God PaceBreak­ers — love love love! We were treated to a hotel room on the Fri­day night with beers, a buf­fet din­ner and cel­eb­ra­tions through the night. Before head­ing home, we had the oppor­tun­ity to spend a day in Petra see­ing one of the sev­en won­ders of the world! A recov­ery day soon turned into a 15km trek but it was well worth the exper­i­ence… even if it did give me an infec­ted blister. We were later taken to the caves for a BBQ din­ner around a fire before being shipped back to the air­port for a sad flight home. There is so much I have taken away from this race. One high­light being sleep­ing under the stars in camp on Day 3 and anoth­er being watch­ing Flora, who suffered from knee issues from Day 1, fin­ish on the last day after 10 hours. It ran shivers through me think­ing what she went through and just to be stand­ing there with every­one else cheer­ing her in. Aside from my pos­i­tion or per­form­ance in the race, the most valu­able thing I will take away from the week are the memor­ies that will be forever ingrained in me and the friend­ships made that I know will last a life time. The found­a­tion of friend­ships made in the desert are like no oth­er and I con­sider myself lucky to have shared such a spe­cial exper­i­ence with all of them.